Built 1833-40. Ithiel Towne, A. J. Davis and David Paton, architects. First State House built here, 1796; burned, 1831. During the colonial period, North Carolina did not have a fixed state capital. Lawmakers traveled to various towns and met in private homes or in public buildings such as courthouses as available. The colonial assembly selected Edenton as capital in 1722 but before buildings were constructed, the center of population moved far enough south to make Edenton an impractical center of government. In 1766 New Bern was selected as capital and construction on Tryon Palace, the home and office of the Royal Governor and meeting place of the Upper House, began the following year. During the American Revolution the government returned to its former nomadic nature, meeting in different towns. 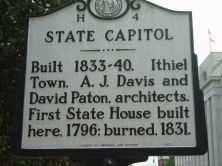 In August of 1788 the Constitutional Convention elected to fix the state capital within ten miles of Isaac Hunter’s Tavern. Not without dispute, the measure was not carried out until April 1792 when commissioners purchased 1,000 acres of land from Joel Lane. The first State House was completed in 1794 but burned in 1831. 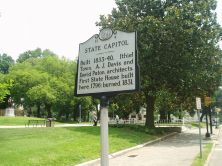 The cornerstone of the present State Capitol was laid at the site of the former State House in 1833. The exterior walls are built of gneiss, a form of granite that was quarried in southeastern Raleigh and hauled to the site on the horse-drawn Experimental Railroad, the state's first railway. While the exterior was completed by New York architects Ithiel Town and Alexander Jackson Davis, Scottish architect David Paton took over the project in 1834 and is responsible for the impressive interior. The Capitol, completed in 1840, is one of the finest and best-preserved examples of a major civic building in the Greek Revival style of architecture and is a National Historic Landmark. The Capitol housed all of North Carolina's state government until 1888, at which time the Supreme Court and State Library moved into a separate building. The General Assembly moved into the State Legislative Building in 1963.